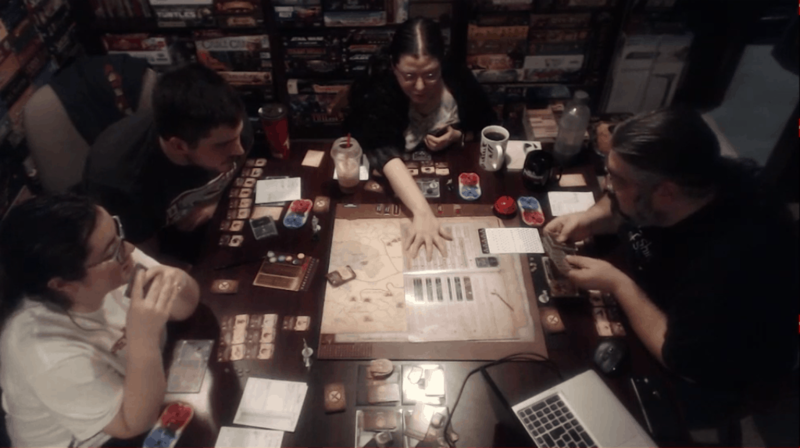 Before moving on to the scenario we spent some time in Gloomhaven checking out the Enhancement rules for the first time. 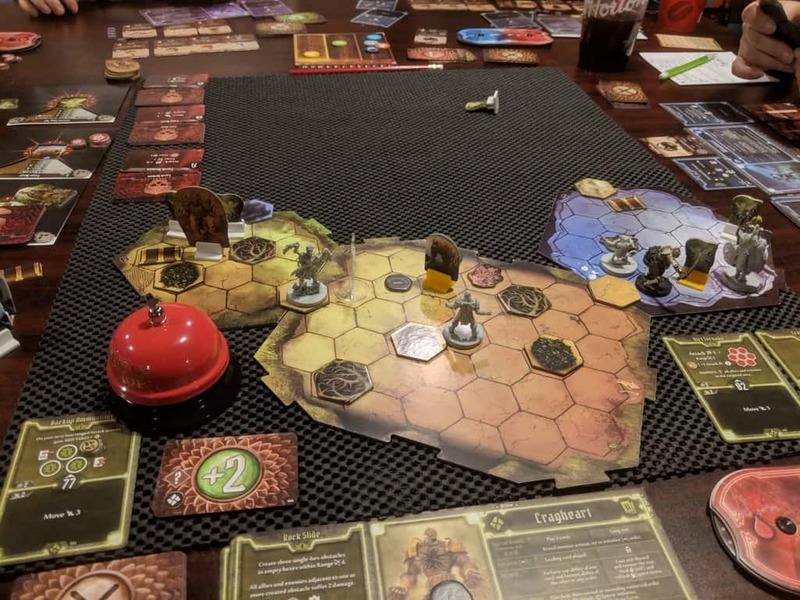 We started off the session in Gloomhaven. There we did a bit of shopping. The main thing I remember is that Tori picked up a ring for his Brute, a ring that can summon a Skeleton. The same ring that Deanna has for her Vermling. The other thing we did was check out the Enhancement rules. This is something that’s right in the core rulebook so I’m not spoiling anything here. This is a system where we as players can improve our cards while in town. You can do all kinds of things from just adding a +1 bonus to a card, to adding status effects to attacks and or movement. You can add targets to ranged attacks and even make area affect cards affect a larger area. Important to our Mindthief and Spellweaver, you can also improve your summoned allies. The thing that we quickly learned is that all of this takes gold. A lot of gold. More gold than any of us is willing to spend. If you check out the video you can see me reading through these rules and all of us debating what we should do, only coming to the final decision to do nothing. Before leaving town we had a city encounter where we found someone stealing vegetables. We had the option to join in, which is what our Vermling wanted us to do, or help recover them. We went with the later. On the way to the Vibrant Grotto we ran into some Innox who tried to hit us up with a toll. Thankfully our own Innox Brute talked some sense into them. I really liked this particular scenario. It was one of my favourite so far. Some of the things I liked included the fact that the map was much larger than most previous scenarios and that the goal was one where we didn’t have to kill all the bad guys. I always enjoy when there’s more to a scenario than killing all the things. I dig the puzzle like feel of these sorts of missions. In this particular scenario, our goal was to loot a bunch of chests. What made this interesting, was that you had to use the loot action to do this. This meant that, for most of us, we had to add our loot cards back into our decks. I know that, for me, my loot card is usually the first card I pull out of my deck at the start of a mission. Sure getting gold is nice, but I’m usually much more interested in having some other, move, heal, or damage card in my deck. Overall this scenario went really well for all of us. We split the group in the first room, which was a bit worrying but it worked out well. Here’s where Tori’s new ring really came in handy. When his Brute split off with our Mindthief (Deanna) it was like having a full party. Counting their summoned allies, there were a total of five of them storming through the right side of the dungeon. Meanwhile, my Cragheart went off with our Spellweaver (Kat) and with the combination of me tanking and her damage dealing we didn’t have much of a problem. We weren’t moving nearly as quick as the other half of the party but we were holding our own with neither of us risking exhaustion.